Technical College. The new name is a result of Barnes' education reform act. What's in a name? On July 6, the Savannah Technical Institute officially became Savannah Technical College. Gov. Roy Barnes was on hand to preside over the festivities, which included the unveiling of a new sign at the college's entrance and the conferring of an honorary associate's degree in applied technology on Barnes. Coy Hodges, the college's interim president, said it was the first degree awarded by the college under its new name. "If you find you need additional training, you can come back," he told the governor, which resulted in laughter and applause from the audience. 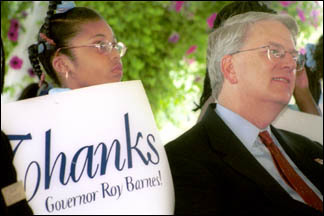 The name change is a result of Barnes' A+ Education Reform Act. Schools that award technical associate degrees, such as Savannah Tech, can now call themselves technical colleges. "This is one of the small changes in House Bill 1187 that will make a big difference in Georgia's schools," Barnes said. "For too long, a stigma has been attached to the term 'technical institute.'" "This seemingly small detail has stopped too many students from taking advantage of the tremendous opportunity our technical colleges represent," he said. "A degree from one of Georgia's technical colleges is a life opportunity, not a last resort." The education reform act has changed funding formulas so that technical schools can be funded based on enrollment. It also allows technical college students to use HOPE grants to take an unlimited number of programs. In the past, students could receive the HOPE scholarship for only two training programs. If additional training was needed, they had to pay for it themselves, forcing many to drop out. Because of these changes, enrollment at Savannah Tech is expected to grow. More than 2,000 students presently attend the college. "This year, our enrollment is up 33 percent," Hodges said. "It is the fastest growing technical school in the state." The new name will give the college and its students greater credibility, said Vanessa Ellerbee, student council president. "This is a very special day for the faculty, staff and students of Savannah Tech," she said. The college already offered one-on-one teaching, counseling and mentoring, and the new name reflects that quality of education, Ellerbee said. She presented Barnes with a card of thanks that was signed by the Savannah Tech student body, plus a framed replica of the artwork that appears on that card. Mayor Floyd Adams praised Barnes' education reform act. "Governor Barnes had the vision, now he has the power to make that vision come true," he said. "If we heed his vision for education, the state of Georgia will be better for it." Over the past year, Savannah Tech has received $18 million in state funding, which has been used to renovate facilities. A 65,000-square-foot occupational building was constructed at the main campus. A satellite campus was opened in Liberty County. Work has begun on another satellite campus in Effingham County that will open this fall. "This is an exciting day for all the technical institutes across Georgia, and it comes at a critical time in our state's history," Barnes said. "Georgia is in the throes of an education revolution." "Parents are tired of the state's mediocre academic performances, like scoring 50th in the nation in SAT scores," Barnes said. "Business leaders are angry that they can't find the well-trained, highly-skilled workers they need." "Students are frustrated that they aren't properly prepared to find jobs, even after 12 years in school," he said. "The problem is the world has changed, but our education system hasn't." A recent study revealed that in 1968, 65 percent of jobs in Georgia required no formal skills or training, Barnes said. "Today the exact opposite is true," he said. "Sixty-five percent of jobs in Georgia require special skills or technical training. And here's the interesting part - just as in 1968 - just 20 percent of jobs require a college degree." Most jobs today fall into a category of their own, Barnes said. "They require special skills, but not a four-year degree," he said. "They require technical expertise, but not a liberal arts education. "That's why Georgia's technical institutes are playing a critical role in improving our education system," Barnes said. "They are training students for those 65 percent of jobs." Schools such as Savannah Tech provide training for workers in fields where employment is booming, Barnes said. "That's why enrollment at Georgia's technical institutes has exploded 110 percent in the last 10 years," he said. "And we must do more to promote our technical institutes, because schools like this one are educating the workers Georgia needs to prosper in the 21st century," Barnes said. "Georgia must make clear its commitment to the quality and prestige of its technical institutes." "Far too many people think of "technical institute" as shop class, Barnes said. "We must make sure people understand that 'technical college' means computer lab." "Today, we're sending a clear message to every child in Georgia," Barnes said. "Our technical colleges give you the chance to be part of our high tech future." Barnes cited his own alma mater. "The University of Georgia may prepare students for the sales and marketing office, but technical colleges like this one are preparing students for the research and development lab," he said. "Ask the CEO of Nortel Networks or BellSouth or Lucent or Earthlink which is more important - they wouldn't be able to tell you," Barnes said. "Today's technical students are smart and savvy, the kind of workers today's companies need for survival." "These schools deserve a name equal to the critical role they play in training and educating Georgia's workforce," Barnes said.